How can business leaders be most effective in supporting employees’ and their own wellbeing, and in looking after any colleagues and employees (or themselves) who are suffering from mental ill health? This week the FSB (Federation of Small Businesses) called for an “end to silence” on mental health and urged Government to work with small businesses and the self-employed – they say that much of the available support is not tailored to small and micro-enterprises’ needs. And a recent Business in the Community report found that only 11% of people feel able to disclose a mental health issue to their line manager. It was World Mental Health Day on the 10th October and in Sheffield it’s been Sheffield Mental Health Week. My latest radio show, broadcast on Friday 13 October on Sheffield Live, included extensive discussion around mental health and wellbeing. Guest Pennie Raven described her own past experience of depression and practical steps to support wellbeing for business leaders, plus how to spot the signs that someone may be experiencing a mental health issue. Jonny Douglas discussed the pressures and stresses around running a business – and how perceptions often differ from reality – with dire consequences. Pennie and Jonny also covered some wellbeing projects that have been supported by Sheffield SOUP. And in an interview recorded at Sheffield’s Moor Market Pop Up Info Stall on Thursday, Rob Lawson covered the work of Sheffield Mind; how more high profile people are talking about mental health; guidance on how to support employees and colleagues in the workplace; Sheffield Mind’s Connect Three Project, Springboard Social Cafes, drop-in sessions and Wellbeing Centre; how staff retention is much higher in sectors that are mindful of mental health; and engaging with people in industries that are particularly performance-related. 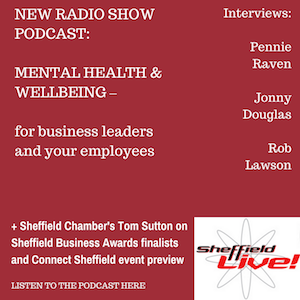 Also on the show: Tom Sutton of Sheffield Chamber of Commerce came into the Sheffield Live radio studio to run through the Sheffield Business Awards finalists and preview the speakers at the forthcoming Connect Sheffield event. Acas’ new guidance to help employers manage mental health in the workplace. More about my Business Live radio show. Meanwhile if you like reading useful, practical advice – that’s also entertaining, then you’re welcome to join my free newsletter email list (if you’re not already signed up). Just pop your details in below.